Which Cities Have Affordable Homes in Silicon Valley? Navigation: Home » Real Estate » For Your Money, What House Should You Target in Silicon Valley? For Your Money, What House Should You Target in Silicon Valley? Editor: This article was first written in 2013. The dollar amounts have changed but the relative location discussion holds. What can you buy for $250,000, $500,000, $750,000, and $1,000,000 in your neck of the woods? Bay Area? Real Bay Area? San Francisco Bay Area? Peninsula? Silicon Valley? COUNTIES? Why is looking for homes in Silicon Valley so confusing? There are a lot of names thrown around when talking about the San Francisco Bay Area. We first discussed the morass of terms in a 2011 article on our site (please see the excellent Burbed blog for a primer on the ‘Real Bay Area‘), but we’d like to address one in particular: Silicon Valley. Silicon Valley is a nickname given to an area which can roughly be described as ‘northern Santa Clara County‘, where silicon refers to a raw material input to Silicon Valley‘s original famous export: chips that you can’t eat. As a term, it’s only around 40 years old – but Silicon Valley can trace its roots back to a single man, William Shockley, who set up a chip shop in Mountain View in 1956 with his firm Shockley Semiconductor Laboratory. An employee mutiny lead 8 young employees to start a competing firm, Fairchild Semiconductor. Then (emulating one of those chapters of the Bible which breaks down an expansive family tree) Fairchild‘s children sprung forth from various ex-Fairchild employees… and you can trace their lineage to well-known firms still in the area such as AMD, Intel, and National Semiconductor. Remember, this is written from the perspective of a resident of Silicon Valley in mid-September 2014. A resident… who actually grew up in the outer expanses of Boston’s suburbs. Always do your own due diligence when considering moving to a new home – even more for a home than you do for your stocks. This is just my perspective, and how I’ve experienced real estate here in the Bay Area. Commute. (Otherwise Gilroy and Morgan Hill would be vastly more popular.) It tends to make the mid-Peninsula more expensive, even if companies aren’t located there – you can conceptually commute to either SF or San Jose from a lot of towns in San Mateo County (but we’ll skip those towns today). Location/Reputation. Some places, notably the Almaden Valley, Rose Garden, and Willow Glen of San Jose, along with north of the 101 in Sunnyvale, and the East Foothills from San Jose up through Milpitas have a price premium even with a commute or a school district tradeoff. For some of these locations, the demographic skews older, while in others private schools are popular. Lot size? What’s an acre? Both homes and lots are measured in square feet. HVAC? There is perhaps a $500 – $1,000 premium on a house with Air Conditioning. Maybe. Modern Electrical? Knob and Tube with a 60 Amp panel? Yep – we’ve seen it, and those houses cost just about as much as houses with copper wiring and 200 amp service. Foundation issues? This is the weirdest one, especially for the first crop of suburban tracts in the 1940s – there is some discount on houses with foundational issues – but not usually enough to fix it! In my opinion, it’s better to look for value elsewhere. Should it matter? Probably. These things cost high 4 digits to low 5 digits to rectify, yet when selling a house they don’t make a difference (if the house is clean inside and has nice paint). But, yes, the “clean inside” bit is where the value is skewed – many families have no interest in renovating a home, so the old real estate advice of buying the worst house in a good neighborhood is incredibly relevant here if you want to break in with the closest approximation to value (remember, it’s high tide for prices already, though!). Imagine hordes of families ignoring houses because the carpet is dirty or the walls have holes or are the wrong color – it’s like HGTV’s prime time on steroids, except because the base prices are so high you can appraise for $100,000 more by dropping $20,000. (Now, take a guess what the house I’m typing this from looked like three years ago). One more disclaimer: I haven’t bought any property in the last 2 years, and I’ve written about how the Bay Area, in particular, is a bit frothy. If I was searching in the Bay Area today, I personally would be renting. With that said, let’s play the quarter million dollar game: what can you get for your money? What Can You Buy for $250,000 in Santa Clara County? Empty land, generally under an acre, and generally in the very southernmost part of the county – Gilroy and Morgan Hill. If you want to park a trailer and save up to build a house while avoiding commuting during anything approximating rush hours (maybe try 6 AM – 3 PM? ), it’s doable, but that’s a massive tradeoff. One short sale on a boarded up town house from 1970. Short sales are very shady here – I’ve dabbled in a few, and never took one down – your mileage may vary (and it won’t end here – some short sales are very shady, but if a non-related party grabs this one I bet it goes for $300,000. Oh, AND IT HAS A $300 HOA.) A Somewhat Related Note: generally, it is safer to buy multi-story properties (especially brick and/or concrete or other masonry) from past the mid 1980s, as mid-decade a number of building codes changed to prevent earthquake collapses. Early 1970s condos in areas of San Jose – but they’re 1 bedrooms/1 baths. And, yes, lower ranked public schools. Manufactured homes and mobile homes. Nothing against this category of homes, as manufactured homes especially have stepped up their game – but space rent and utilities on this category of homes can be more than renting in a prime area. Buying a beautiful manufactured home only to pay $1350 a month to rent the space? You tell me if that tradeoff is worth it. Winner: Just rent, in my opinion. Perhaps manufactured homes will give you the best comforts if you have a family, at the expense of land rent… but those rents are huge! A single person might get away with a cheap condo in San Jose, but do tons of research first. What Can You Buy for $500,000 in Santa Clara County? Single Family Houses in San Jose: As I search, there are three houses I’d check out in San Jose: but I would expect overbidding, in the range of $600,000 for any of them. A fixer in 95128 (arguably West San Jose), a house in 95148 (an undervalued neighborhood known as Evergreen, but this house doesn’t appear to have the Evergreen schools – buyer can verify), and a house in 95131 which backs up to non-residential zoning (Western Berryessa neighborhood). Single Family Houses in Gilroy: Here’s where your money will go farthest – in terms of home quality and schooling. It’s about 45 minutes from midtown San Jose to midtown Gilroy with light traffic, and there are about 15 reasonable homes for sale in this range. If you work in the South Bay, this is doable – but it won’t be the most fun you’ve ever had (best to try to shift your commute to odd hours). Condos and Townhomes: I was able to set the parametric search to the year 1990 and newer to capture the safer building codes, and there were still a fair number of condos left. My eye is drawn to San Jose’s downtown area – there are a number of 2/2s for under half a million in 95110/95112 – some of them very walkable. There are other places nearer the airport (including some nice townhomes built in the last housing bubble), but the best bet for a single person is downtown. Winner: Gilroy! For a single, San Jose’s downtown has experienced a bit of a revival lately, although even with a larger population base than San Francisco… it’s still the more overlooked. What Can You Buy for $750,000 in Santa Clara County? Short answer: Approximately what you could get for $450,000 in 2011. 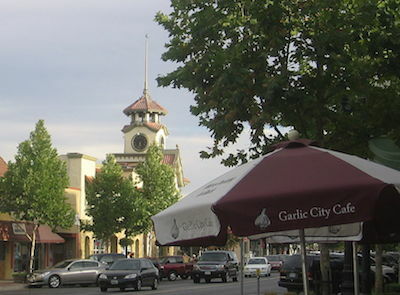 Read: Up and coming neighborhoods in San Jose, your pick of Milpitas, and the occasional highly valued zip code making an appearance with caveats. The value is in the land, remember (or, if you prefer: Location, Location, Location)? Your Pick of Up-and-Coming Good School Neighborhoods in San Jose: If you want a renovated house – (well, 1,000 – 1,200 square foot single level mid century ranch from the 1940s through early 70s – I’m not joking! PDF warning. ), you’re in the right price range. Interesting architecture – Mid Century Modern inspired houses from more famous builders, and really anything with clerestory windows or 15 foot ceilings – is either in very bad shape or wildly out of reach (read: no Eichlers). But there are ranches galore in fine school districts: Berryessa, Cambrian, Evergreen, and Santa Teresa in San Jose, east of Abel Street in Milpitas, older homes which could use a refresh in Campbell – and if you leave the county, there are a few homes in the highlands of Fremont. The Fringes of High-Reputation Neighborhoods in San Jose: There are 2-3 houses right on the periphery of high reputation neighborhoods like Willow Glen and Almaden Valley. Good luck (and Willow Glen doesn’t have the school ratings that Almaden Valley does). Condos and Townhomes: Your choice of neighborhoods in San Jose, Milpitas, Campbell, and most of Sunnyvale – and entry level into some of the towns further up the peninsula. I wouldn’t count on them being there later, but there are some in Mountain View and Cupertino (1/1s) and a solitary one in Saratoga. Winner: Your pick of San Jose or Milpitas! Milpitas has the best bang for the buck school-wise, but there are a number of fine homes in your price range in Berryessa, Cambrian, Evergreen, and Santa Teresa – and if you’re really lucky you can try to take down one of the more prestigious neighborhood (Good luck – maybe if your $750,000 is in cash, or you bring another 6 figures to the table). For the singles, I’d be careful here – San Francisco is more desirable at this price range. North and West, closer to the water (I’m particularly fond of the Marina, but I’m not single anymore…) is where I’d head for my dollar – but ask an expert such as our friend the Financial Samurai for the SF market dynamics. If you’re going to go for the South Bay, carve out prime territory in Mountain View near Castro or in San Jose either near Downtown or Santana Row for exceptional walk-ability. What Can You Buy for $1,000,000 in Santa Clara County? Now you’re almost talking – you still aren’t getting into Los Gatos, Saratoga, Monte Sereno, or Almaden Valley (except by a fluke, teardown, massive fixer, or short sale… maybe), but your options open up a tiny bit. Lots of San Jose Architecture Options: Anything over 1,500 square feet is a mansion in the Bay Area. Pick something up from one of the neighborhoods mentioned above and add an extra kid to the family! The East Foothills are also a neighborhood which becomes an option here (bonuses… unique architecture: no 1,100 square foot ranches; epic views) – although, like Willow Glen, school ratings aren’t as high. Speaking of Willow Glen, your options have opened up – and you also can buy on the periphery of the Rose Garden and Shasta-Hanchette Park (architecture: Craftsman). Or, expand your lot size over 5,500 square feet… you’re at the point where your San Jose options are numerous. Boring Ranches in Other Towns: Still married to the idea of an 1,100 square foot ranch of indeterminate age? Buy your way into Campbell or Santa Clara (Santa Clara: not as highly ranked on the High School front, very good on the Elementary front)! Mountain View: Probably a town house, but a few single family ranches pop up in this price range. Sunnyvale: Below El Camino has the better ranked school districts, and if you’re willing to put up with locational issues (busy street, bordering non-residential, near a school, noisy) you might be able to snipe a home in this range. Good luck. Winner: I’d attempt to snipe one of the Sunnyvale or West San Jose options, or perhaps Almaden Valley. Private schools are an option with some of the aspirational neighborhoods, but you’re probably better off dropping to the $750,000 range and dealing with an 1,100 square foot ranch if you have a young family. For a single (if you’re really still against San Francisco! ), Mountain View is well within your reach – or very nice places near downtown or Santana Row in San Jose. What About Real Estate Comparisons in Other Areas? This was a part of a giant collaboration of financial writers, so there are a number of other articles being published today in a similar vein. Make sure to open up a number of tabs; there are some great perspectives below! Sorry, it was slightly better (40% off!) a couple years ago – but in my opinion the sweet spot (if one exists!) nowadays for homes in Silicon Valley is somewhere between $675,000 – $850,000 in the South Bay, for a typical 1-1.2k square foot ranch in a well ranked school district in Fremont, Milpitas, or San Jose. The next tranche of homes opens up in the $1.25m – $1.75m range: think Saratoga, Los Gatos, Cupertino, Palo Alto, popular Mountain View Neighborhoods, popular Almaden Valley homes and huge homes in the East Foothills… along with a much bigger range of Sunnyvale properties (probably the sweet spot in the price range for a young family). Yes, it’s crazy in the Bay Area – the highest rated public schools force single family home prices to around a million and a half to start, and the highest rated private schools cost more than some colleges. But hey, the Bay Area is the current lead driver of prosperity in the important state of California – so you can’t be that surprised. Oh, and you can always rent. What are prices like near you? Where do young families tend to buy with schools in mind? How about singles? Based on some of these numbers it seems like San Fran is like NYC in that a lot of the time it makes more sense to rent. Absolutely – which is nuts from a certain perspective, since even 3 years ago would have bought you about 50% more house in each price range. I’d like to think that if I hadn’t already bought today I’d be looking for a rental, but you can maybe get something acceptable for $600 – $650. New York though – you folks are really something else in the real estate game, even with the 8+ million people and requisite number of houses and apartments! Haha – you know, there are still a few neighborhoods where it’s okay to rent. For many of the neighborhoods highlighted, divide by about 200-300 or so to figure out the rent – $750,000 houses at $3,300 a month are doable (and $500,000 for $2300). Tack on slightly higher professional salaries due to the high cost of living and you’ve got a reasonable place without the shackles of the mortgage. WOW! I knew that housing was expensive, but that expensive? Here in Dallas, we have a pretty reasonable cost of living, and housing is very reasonable, but its rising, quickly. Our home appreciated more than 12% in the past 2 years. My co-writer Cameron is outside of Dallas – I’m continually amazed at the amount of house you can get for… well, a lot cheaper than my primary residence, haha. He has been telling me about the water shortages in the suburbs – massive growth on the outskirts of town means you guys are looking at a bunch of public works projects in the not-too-distant future. Reasonable problems to have when you’re growing like the DFW metro! Dallas is definitely on my list – I could certainly see myself living in your neck of the woods someday. We would love to move to California. My mom grew up in southern California and we visit often, but if I stay in the rocky mountains I can retire much earlier since the cost of living is so much cheaper. We’ll be out to visit often, but the goal is to retire, not live in the sun and work forever. You could do the old “rent and work in Silicon Valley and retire elsewhere” scheme? If you moved your career over here, you’d get some income boost due to the cost of living – companies tend to pay a bit more. Some of that will melt away to higher taxes and the like, but if you’re careful you can live below your means even in a place where 1,100 square foot ranches can tip 7 figures. (And not in our defense – we’re not as bright and sunny as California’s expensive southern coast from Santa Barbara down to San Diego). Heh – you’d be better off in Southern California. Outside of the summer, we’re right at the boundary of good Vitamin D exposure: http://www.health.harvard.edu/newsweek/time-for-more-vitamin-d.htm . Perhaps a nice place in Santa Barbara – or, better for the Vitamin D, San Diego? But, yeah – not so bad in our extended annual summer! The Mediterranean climate is a nice touch (I argue that the Mediterranean should call their climate ‘Bay Area Climate’… to little effect). Fantastic post! How did I miss this? This is hilarious that you know about this! Because this is something I have on my list of things that must be upgraded since a house with 60Amp just won’t do in today’s electric society. Can upgrading te service be a business write-off if your business highly depends on electricity and internet?? The market does seem like it’s softening. I’ve had a number of people finally buy after being outbid before. I just still see so much value in SF after traveling everywhere. Which area did you end up buying? We bought on the periphery of a good school neighborhood and a high valued, worse schooled neighborhood (in the school boundaries of the good school neighborhood, with many of the views and the better architecture of the other, haha). You’d be shocked at the number of 60-100 amp houses we saw, and the sizes. “Fuseboxes” would have been the name of the game, not these convenient circuit breakers, haha. Our service is 125 amps, but we haven’t had any issues yet (we switched the stove to gas), except one time when the plasma was on, the dryer was running, a few computers were going… and the A/C switched on. PS where are your social buttons? I need to tweet this post! They only float along the left side of the screen – you’re right, I really need to have more obvious article related ones, haha. I’ll see what I can do today. Trivalley, Pleasanton/San Ramon/Danville area is a good option! It has excellent schools from elementary to high school. Very nice and pretty area, nice neighborhood. Houses go for $800K – $1M range for >2000 sq ft! Best deal in the bay area. Draw back is commute to work in the south bay. Distance is not far, only 25miles away, traffic is horrible, about 1hr – 1.5hr to the heart of silicon valley each way.